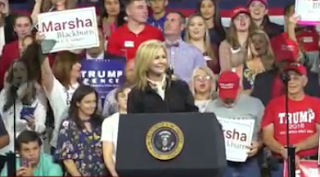 President Donald Trump held a "Make America Great Again" rally in Johnson City, Tennessee Monday night to support Rep. Marsha Blackburn's campaign for the open Senate seat vacated by Bob Corker. Blackburn's opponent is former Gov. Phil Bredesen. Recent polls show a tight race that could go either way depending on which side can turn out more voters on election day. The last president to visit Johnson City, which is in the far northeastern corner of Tennessee, was Gerald Ford in 1976. This will be Trump's sixth visit to Tennessee since he began his campaign for the presidency in June 2015 and his first as president. The event was held in Freedom Hall, with an official capacity of 8,500. The hall was jam packed, reportedly forcing many to stand outside and watch the event on a large screen. Trump defended Supreme Court nominee Judge Kavanaugh as "a very fine man" and criticized Sen. Dianne Feinstein for her delaying tactics. Kavanaugh could be investigated for 10 years and it still wouldn't be enough for the Democrats, he said. "This November," Trump said, "you have the chance to reject the outrageous politics of the Democrat Party...Democrats are the party of crime. Sounds a little tough but it's true--open borders." Trump invited Marsha Blackburn to the stage. "I am asking you to stand with me," she said, in cutting taxes and building the wall. "Let's take these Tennessee values to Washington, DC and work with President Trump!" 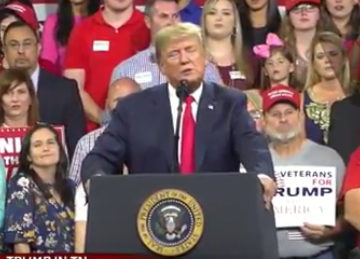 Tennessee unemployment doubled while Phil Bredesen was governor, Trump said. "Phil was a major financial supporter of President Obama and crooked Hillary. He will never vote for us. Phil is only running because Chuck Schumer called him up and begged him to run." Democrats, Trump said, "want to turn freedom into socialism. They want to turn America into Venezuela. Democrats want to abolish ICE. [They] support sanctuary cities. Every day, innocent lives are stolen because of Democrat Party immigrant policies." "This election is about safety and it is also about prosperity," Trump continued. "We created over 4 million new jobs and lifted almost 4 million Americans off of food stamps. We added nearly 600,000 manufacturing jobs. That wasn't supposed to happen. African-American unemployment is the lowest in history. Hispanic-American and Asian-American unemployment reached their lowest levels ever."